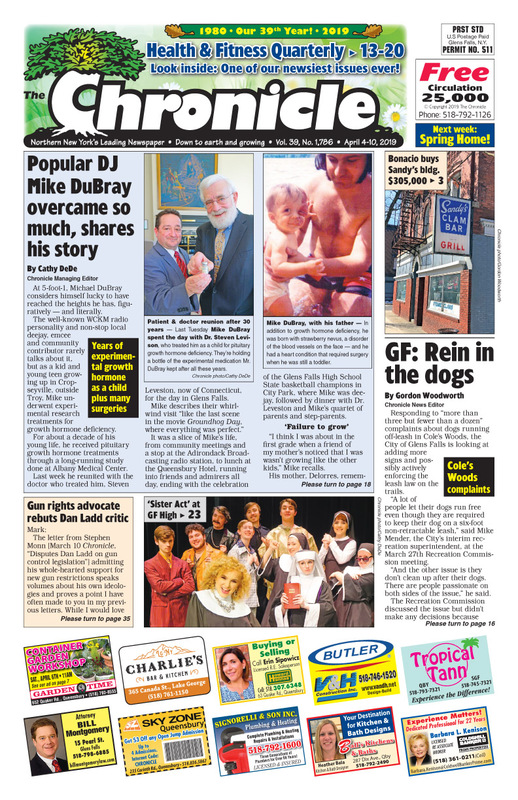 Health & Fitness Quarterly issue | Popular DJ Mike DuBray overcame so much, shares his story. Bonacio buys Sandy’s bldg. $305,000. GF: Rein in the dogs. Planned ‘gaslight.’ chef Colin Miner at Queensbury Hotel. GF adds $5 per seat to outdoor dining permit fee. [farmacy] restaurant at 22 Ridge St. opens. Common Roots benefit Sunday, at the Qby. Hotel. Jimmer’s new son, Taft. Jacob Houston at Hyde. Concerts, comedy, shows… The Chronicle always has the region’s best Arts & Entertainment section!